The shades of healthily growing forest and fruit-bearing trees on the steep slope of Kawa-Kawa Hill near Ligao City, give thousands of people from all walks of life, who struggle their way to its summit during the weekend, a perfect cover from the scorching heat of the noontime sun. The mass trek over the winding, narrow concrete walkway was for the solemn celebration of the Way of the Cross, a Lenten event that has made the dramatically unique peak standing 236-meter above the sea level not just a stunning ecotourism destination but a religious landmark that only this quietly growing Bicol city could offer. At the huge parking area along entrance of the place, dozens of private cars, buses and jeepneys and hundreds of motorcycles that took these people from different parts of Bicol and other places of the country are neatly arranged on standby. 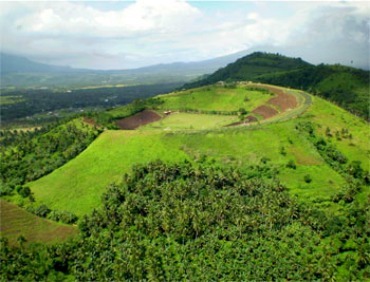 From the national highway, two kilometers away, Kawa-Kawa Hill sits deep on the edge of Barangay Tuburan, four kilometers from the city downtown, and can be seen as nothing but only one of the series of peaks walling the southeastern side of the village. Reaching its summit, which could be done only on foot via a 500-meter ascending walkway, would tell an entirely different story -- from the back-breaking experience of negotiating the sharp slope to the stunning view that always gives new visitors an eye-popping amusement. Nicknamed the “hill without a hilltop,” Kawa-Kawa’s summit comes as a thin wall that surprisingly encircles a sunken three-hectare plateau forming a sprawling flat surface that looks like an elegantly-landscaped amphitheater that is carpeted with carefully-mowed green grasses and serves as a playground, activity complex, horseback riding field and camping site. From this sprawling lower ground, the surrounding view is nothing but all about the thickly vegetated surrounding wall and overhead is the round-shaped infinity of the sky. Hence, the hill’s name is derived from such natural feature that resembles a “kawa” the local term for cauldron or Chinese wok. The top of its rim, however, offers the panoramic view, on the northwestern side, of the entire city sitting amid an expansive green field of rice paddies crisscrossed by irrigation systems deriving water from rivers whose banks are guarded by concrete flood-control structures. Such scenery draws sighs of confidence that the city, whose development is primarily focused on its agricultural communities, is assured of sufficiency in farm-sourced food supply. The same direction also offers a full view of Mt. Masaraga---an extinct stratovolcano described as a forested, sharp-topped mountain with an elevation of 1,328 meters above the sea surface and located adjacent to the iconic Mayon Volcano whose upper part of its perfect cone shape could be viewed protruding over another nearby peak at the northeastern side of the hill. The other side offers an amazing view of high forest-covered mountains shadowing vast farms on a wide plain that is so refreshing to look at. The natural ambience and healthful surroundings offered by Kawa-Kawa Hill is supported by the gentle blowing of the wind that soothes every visitor’s body with cool and refreshing air even during summer -- when the blooming of sunflowers on established fields all over the place down to street sides, backyards flower gardens and public parks in the city -- is an impressive sight. The city celebrates its yearly Foundation Day in May highlighted by its Sunflower Festival, a socio-cultural celebration and thanksgiving for what every Ligaueño has achieved during the year. The narrow surface at the top of the hill’s rim that stretches 836 meters encircling its arena look-alike interior, as well as both sides of its wall, are teeming with trees standing along the undulating concrete walkway that also locates along, 10 of the 14 Stations of the Cross—the first four being placed along the way up starting from the halfway going to the summit. Every Station, located a stone's throw away from each other, comes with bigger-than-life-size, finely-crafted concrete sculptures depicting the biblical events in the final life of Jesus--from His prosecution and crucifixion to entombment. These revered structures were put in place over 10 years ago by then city mayor now Rep. Fernando Gonzalez of Albay’s third congressional district based on the idea introduced by the Carmelite Sisters who have their huge chapel and religious compound by the foot of the hill. Since then, the place which Gonzalez and his group of developers privately owns and developed -- first as an ecotourism site by painstakingly nourishing its ecological assets—has become a magnet to tourists on a year-round basis and pilgrims during the Lenten weeks. Although a private property, the hill and all facilities it has like open cottages, toilets, stage, kiosks, viewing decks, clubhouse and dining halls are open to the public for free. Also, no space rental fee is collected from local entrepreneurs who maintain food shops, refreshment stalls and souvenir stores along its entrance and at the summit. Garbage bins are all over the place, disallowing littering around the place so that there is n need for workers to maintain its cleanliness while security and medical personnel are deployed by the city government to provide assistance to visitors. Last Saturday’s grand occasion, participated in by about 1,000 pilgrims and high school students representing several Albay dioceses, was for the Diocesan Youth Way of the Cross, now on its sixth year of being held at the Kawa-Kawa Hill. Gonzalez -- who, as a devotee, walked barefoot all throughout the Via Crucis procession over a more than one-kilometer distance with his wife, former city mayor Lilia Gonzalez-- led the hundreds other devotees who joined the solemn celebration officiated by clergy people headed Albay Bishop Joel Baylon. On Sunday, several other pilgrims arrived from various places of origins for the same ritual of their own which Tuburan villagers describe as part of season-long arrivals owing to its popularity as a Lenten destination established by Kawa-Kawa Hill. Indeed, this astounding peak, kept more lovely and natural by the singing of the birds, is an out of this world venue for the nourishment of one’s soul and health as doing up there the Way of the Cross with the family, peers or friends is a healthier way to do it.